The Golf has become quite a cult icon since it came onto the market in 1974, and since 2002 it’s also been Volkswagens highest selling model. Over the years, and different generations the Golf has become less angular and sharp; more round and tactile. The current Golf VII Update changes little with its current design, but adds further refinements. 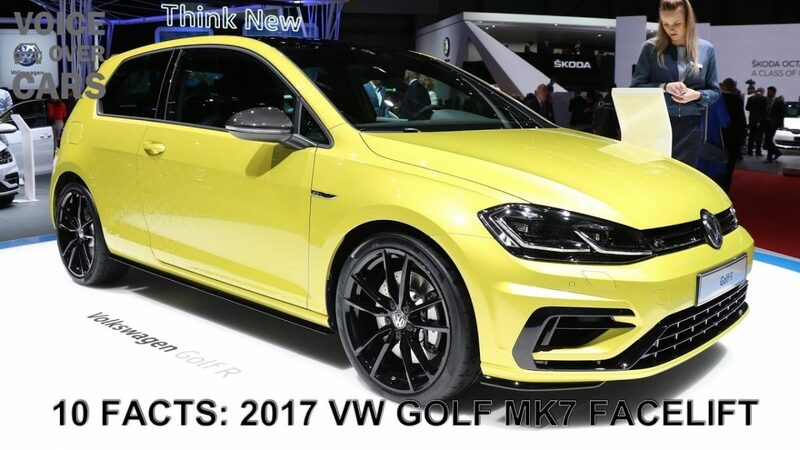 Let’s see what that means for the new Golf; visually and technically. Staying true to its premium status, the Golf MK7 Update delivers high-quality throughout. The clear design language provides many options for individualization, such as different rim designs from 15 to 18 inches with different finishes. Sports versions like the GTI can also be equipped with larger, 19-inch alloys. There are newly designed headlights and a powerful radiator grille which makes for a distinctive, confident appearance. Just behind that, there’s a sensor for the optional assistance systems. Depending on the equipment line, you can also get inset chrome strips. The base model still comes with standard halogen headlights, but you now get LED daytime running lights. You can of course have have full-LED headlights as an option, you can also get curve lighting or LED fog lamps. Before the latest update, the Golf MK7 scored well against its competitors with interior space. This of course remains the same: leg room in the front and back is more than sufficient for even tall passengers. In addition, the whole interior is fitted with the high-quality workmanship you would expect, and everything serves to enhance the driving experienced. Especially the new Active Info Display, this gives you a 12.3 inch display instead of the two traditional instrument clusters. Infotainment systems have of course also been updated. The new top infotainment model is the Discover Pro. It features an eyecatching 9.2-inch touch screen that looks and feels modern and high quality whilst staying simple to use and intuitive. You can also have full smartphone integration. App Connect brings you Mirror-Link, Android Auto and Apple CarPlay – ready for pretty much anything you could want to connect to your car. The VW Golf MK7 Update also offers intelligent driver assistance. This not only increases comfort, but support in tough situations. There’s Front Assist and City Emergency Braking with pedestrian detection to help keep you safe in the city, and ACC which monitors and adjusts the distance between you and the car in front to keep you safe on the road. It can even adjust to traffic jams to save you from needing to make constant changes when traffic conditions change. If your car detects that you are no longer in control for any reason, the Emergency Assist takes over partial control and initiates safe braking. So there you have it. The Golf 7 faceflift is not quite a reinvention of the Golf but it has sharpened and freshened up the design whilst adding some new and nicely thought out features.